Former assistant U.S. Attorney Lola Velazquez-Aguilu is the Commission on Judicial Selection’s new chair. Velazquez-Aguilu, currently Medtronic’s litigation and investigations counsel, has served as a member of the selection commission since 2016 and has participated in selecting 13 judges. Gov. Tim Walz and Lt. Gov. Peggy Flanagan announced her appointment as chair Wednesday. “We are confident that, as chair of this commission, she will continue her commitment to supporting a diverse and independent judiciary,” Flanagan said. Supreme Court Chief Justice Lorie Gildea said the commission’s chair is among a governor’s most important but least noticed appointments. The commission acts as a hiring committee for judicial applicants, screening candidates based on merit, she said. “This merit selection process has served Minnesota well, and I am confident that under Lola’s leadership, the commission will continue to do so,” Gildea said. Velazquez-Aguilu said the statute that governs the commission requires it to actively recruit candidates from across the legal profession and adheres to the idea that a diverse judiciary is superior. She said Minnesota’s judiciary needs high-caliber candidates who demonstrate a commitment to service, community, the rule of law, and fairness. She called on lawyers answering to that description to apply to become judges, and asked others in the legal community to help identify candidates from around the state who represent diverse backgrounds. Speaking to reporters, Walz said that naming Velazquez-Aguilu as chair might be “one of the most important appointments that we make.” The commission helps assure that the state has an independent and representative judiciary, he said. Walz said he plans to build on the example set by former Gov. 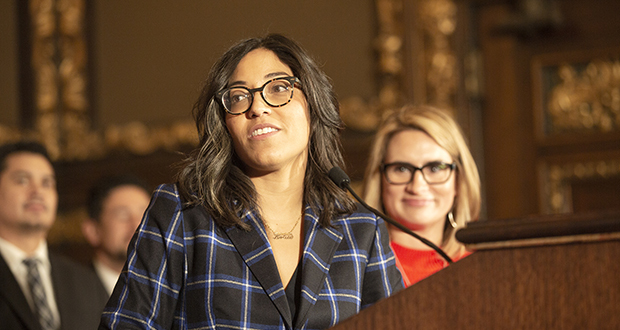 Mark Dayton by making the state’s judiciary more fair, equitable and inclusive, adding that Velazquez-Aguilu will help lead the selection commission farther in that direction. Governors may — but are not legally required to — choose from among the candidates the panel recommends. Walz said he will reserve the right to appoint judges not forwarded by the commission, but plans to follow its lead. The state Supreme Court originally appointed Velazquez-Aguilu to the commission three years ago. She previously worked as an associate attorney at the Dorsey & Whitney law firm and clerked for both U.S. District Court Judge Ann Montgomery and former state Supreme Court Associate Justice Alan Page. She also has been a co-chair of U.S. District Court Magistrate Merit Selection Panel and was on Attorney General Keith Ellison’s transition team. She said Wednesday that she will continue in private practice while chairing the commission. The 49-member Judicial Selection Commission solicits, evaluates and recommends candidates for the district trial courts and Worker’s Compensation Court of Appeals. Members must offer the governor between three and five nominees no more than 60 days after they are notified of a vacancy.